The Problem: Sports are the second leading cause of brain-related injuries of people aged 18–24, with roughly 3.8 million sports-related concussions every year in the US. Of the athletes who show signs of a concussion, many are not removed from the game and continue to play with symptoms, or they return to play too soon. 50–70% of athletic concussions go unreported. Despite the severe repercussions of concussions, the current culture in sports is one that does NOT encourage reporting concussions. Athletes are hesitant to report the issue due for reasons including being removed from pivotal games, jeopardizing their future careers in athletics, fear of being judged by their teammates, or simply the lack of awareness that they are concussed. The Solution: To reinforce the idea of reporting concussions, the NCAA announced that research teams from eight universities would receive Mind Matters Challenge grants. The goal of this grant program is to change the culture in college sports to motivate more athletes to report concussions and other head injuries. The University of Georgia is one of those universities to receive a grant and has begun to develop its plan for intervention. The UGA team is led by Dr. Julianne Schmidt, Assistant Professor of Kinesiology and Director of the UGA Concussion Lab, and Dr. Welch Suggs, Associate Professor of Journalism and Associate Director of the Grady Sports Media program. The UGA Department of Kinesiology has partnered with Grady College to work with teams from the UGA New Media Institute (NMI) capstone class. These brave New Media students will assist in developing an interesting and engaging web application for collegiate student athletes, thus providing them with an experience that will increase their likelihood of reporting head injuries. 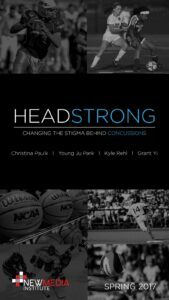 Project Features: HeadStrong is an interactive web application made specifically to educate and capture the attention of collegiate student athletes. The main feature of the web app is a decision-making video module that will allow student athletes to indirectly experience concussions from a first person perspective. Each student athlete logs in to the HeadStrong website with a unique username and password in order to track their progress in completing the web app. Through the video module, student athletes will learn about the symptoms and short-term effects of concussions with a “choose your own adventure” style story. Tailored content in the video module is delivered to each user based on age and gender to provide users with a more relatable experience in the web app. The HeadStrong web app provides athletes with the knowledge and confidence to report their injuries immediately for a faster recovery, and emphasizes the instant benefits that follow. HeadStrong is supported by a variety of web tools and frameworks to make the online web application come to life. The front-end consists of HTML and CSS code to deliver a visually appealing website and content. Bootstrap is utilized to ensure that the website is responsive and able to be viewed on multiple devices. In addition JQuery is key to creating animations and manipulating DOM elements; this is what makes HeadStrong eye-catching and keeps the user engaged. HeadStrong consists of several user paths and databases so Angular2, NodeJS, MongoDB, and Mongoose are the backend frameworks that build the backbone of the HeadStrong web application. Lessons Learned: The journey to develop HeadStrong was not an easy one. 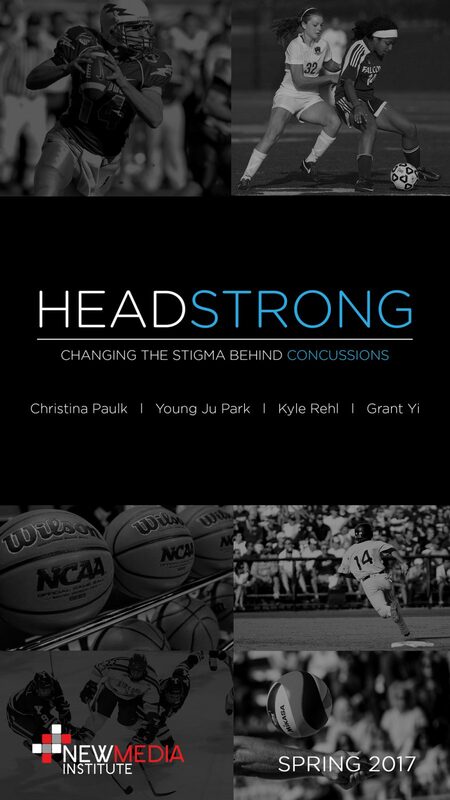 The HeadStrong team faced many challenges in developing an effective and impactful solution that would truly change the stigma surrounding concussions. After chasing many ideas and even having to completely pivot the project direction based on client needs, the HeadStrong team has learned that finding the solution to a problem isn’t simple. Especially when it comes to working with clients, communication is key to delivering an effective end product. Today, the HeadStrong team is stronger than ever and has put all of their energy and efforts into creating an engaging and impactful web app that will hopefully make a difference to change the stigma behind concussions.